This is how I cut spareribs St. Louis style. This cut involves removing the skirt meat on the back side (bone side) of the slab and also cutting off the brisket or what is also known as rib tips. Everything we cut off will still be cooked, nothing goes to waste! To do these cuts you'll need a cutting board, sharp boning or large knife, and several paper towels. First turn the slab of ribs meat side down so that you can see the skirt or flap of meat on the bone side. Sometimes you'll find this has already been removed by the butcher and you can skip this step. 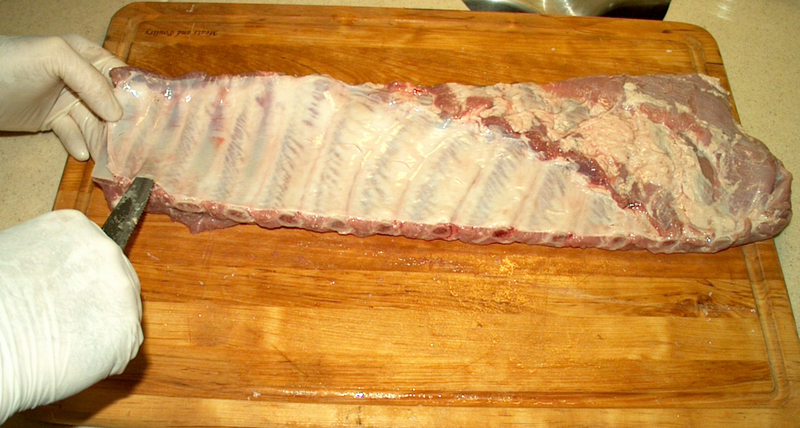 Figure 1: An untrimmed slab of pork spareribs. Simply grab the skirt meat and as you lift up on it, cut it away from the slab as close as possible without exposing the bones (see Fig. 2). I always cook the skirt meat using the same rub for the ribs. The skirt meat will cook up quickly and is a "sweet treat" for the cook! One other thing you can do to the skirt meat is remove the membrane on the back of it. This will make the skirt piece more tender but not absolutely necessary. Figure 2: Removing the skirt meat from bone side. Next step is to flip the ribs meat side up and remove the brisket (rib tips). This is where a good knife is needed. 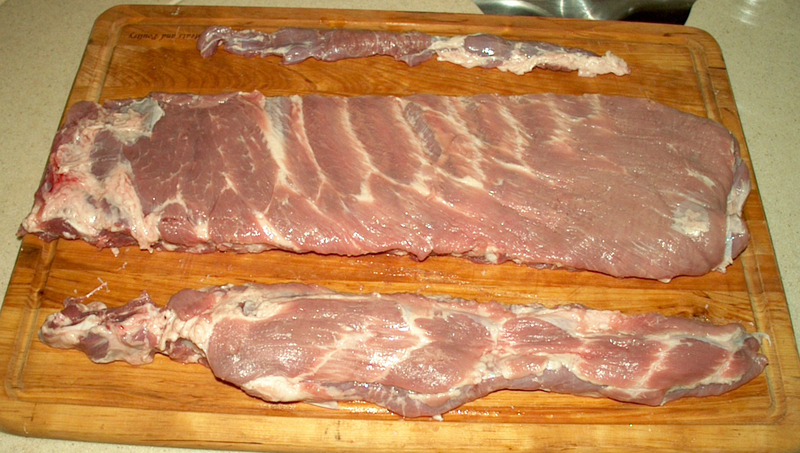 The object here is to cut the slab into a uniform width so that the ribs cook more evenly (see Fig. 3). Start at the end that has the largest bones. Find where the joints are between the rib bones and the brisket. You want to cut right thru these joints or you'll have a tough time cutting thru bones. Also notice how the rib bones change about half to two thirds of the way down the slab. You will be cutting thru the joints on about the first 5 to 7 ribs. The last half or third of the slab will consist of bones that are more like cartilage. When you get to these bones, just continue to cut the slab at the same width as you cut the first bones. This will give you a uniform rack of ribs. At this point your spareribs will resemble a slab of baby backs. 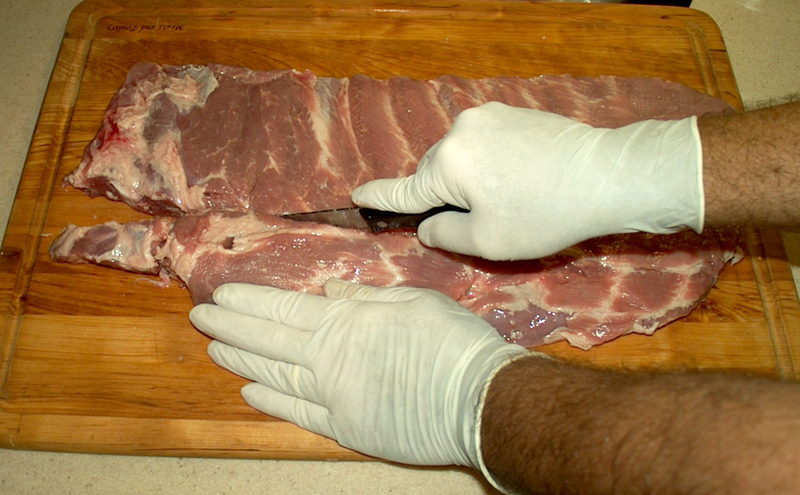 Figure 3: Trimming away the brisket. 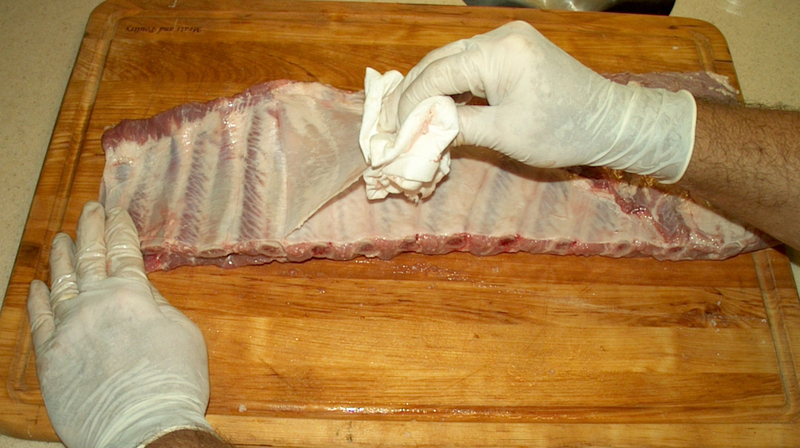 The last step to our St. Louis style ribs is removal of the membrane on the bone side. Removing the membrane makes for a more tender rib and also allows more flavor from smoke and rub to penetrate. Start at the large bone end and gently try to pry the membrane up with your knife (see Fig. 4). A butter knife actually works better than a sharp knife at prying up the membrane. Once you lift the edge of the membrane, you'll notice what appears to be another membrane layer. Do not remove it. The second membrane is needed to hold the ribs together. After you get the membrane started, work your finger under the top membrane until you have it pulled loose on the first rib bone. Now you can use the paper towels. The membrane is hard to hold onto, but you can get a good grip with the paper towels. Holding the slab down with one hand, begin pulling the membrane back away. As you get some of the membrane pulled off, roll it around the paper towel so that you can pull on the membrane closer to the ribs. This will help keep the membrane from tearing. If it does tear, just try to pry it up again and grip with towels and continue removing until all of the membrane is off. Figure 4: Prying up the membrane. Figure 5: Pulling off membrane. In Fig. 6, the top piece of meat is the skirt that was cut off first. The bottom piece is the brisket or rib tips and the middle piece is the rack of St. Louis style spareribs. Figure 6: The finished pieces from St Louis Style cuts. Figure 7: St Louis Style ribs, rubbed & ready to cook!